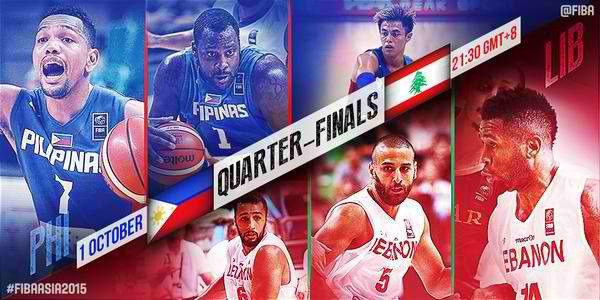 FIBA Asia 2015: Gilas Pilipinas vs. Lebanon Live Stream, Schedule and Time - Balita Boss! The Philippines men's national basketball team will resume their bid to earn a ticket to the 2016 Basketball Olympics when they play Lebanon in the quarterfinals of 2015 FIBA Asia Championship . Gilas Pilipinas swept their three matches during the second round to top the Group E with 4-1 record, while Lebanon with 2-3 record seeded fourth in group F.
Video Highlights: Gilas Pilipinas defeats Lebanon, 82-70 | #FIBAAsia2015. The Gilas Pilipinas are just one victory away from an appearance in a second consecutive FIBA Asia Championship Final after fending off a brave challenge from Lebanon on Thursday. Behind the powerhouse combination of point guard Jayson Castro and big man Andray Blatche, the Filipinos won, 82-70, to set up a Semi-Final with Japan on Friday. Continue reading the full story on FIBA.com.